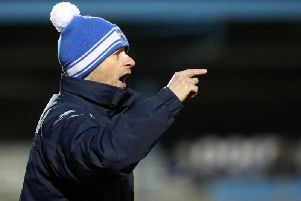 An emotional and hoarse Ballinamallard United Manager Harry McConkey could barely contain his delight at guiding the Championship side to an unlikely Irish Cup final following Saturday’s penalty shoot-out victory over Premiership outfit Warrenpoint Town. Having already ousted top flight Dungannon from the quarter-finals by the same means, McConkey’s men booked date with current Premiership champions Crusaders in the showpiece decider on May 4. And the Fermanagh men were good value for their victory, having arguably been the better of the two sides at Mourneview Park and while 120 minutes couldn’t provide a goal, nine out of the 120 penalties in the shout-out were scored with Mallards veteran keeper john Connolly saving Matty Lynch’s effort, which proved enough to put McConkey’s team through. “It’s a real surreal feeling,” admitted the Ballinamallard manager on the pitch as their support continued to sing loudly long after the final whistle. “I would never let the words pass my lips that we’ll be in an Irish Cup final to be truthful with you. “To do it with a team from my own county where we have very much been the underdogs for the last two rounds, it’s the courage of the players that I’m absolutely delighted with. “They have a never-say-die attitude. They got right in their faces in the first half and I thought we controlled a lot of the game, especially in the first half. Second half, we had to dig deep and we did just that. “Extra-time it could have gone either way and we knew one goal would win it. The players were so courageous with those penalties. “During the penalty shoot-out, I always watch them because it’s the least you can do when somebody is brave enough to step up. You owe it to them. “The quality of the penalties, that’s the bit you do enjoy. But it’s a horrible way to lose and I definitely do feel for Stephen and his team in that sense because it’s awful,” he admitted. “We’ve worked very hard on our pressing game. We’ve been trying to develop that all season and this was a real test, because they love to play out and create. Having been relegated from the Premiership at the end of last season, the Mallards endured a torrid start to this campaign, losing nine league games in a row after winning their opener in the Championship. But McConkey stuck to his principles and his side scraped into the top six in the second tier and now have an Irish Cup Final to look forward to.